Battlefield 1's campaign manages a somber tone but the game still manages to sneak a ridiculous pistol into the multiplayer for some laughs. It’s super small and super not deadly. Youtuber jackfrags captured footage of the dainty Kolibri pistol in a new video. 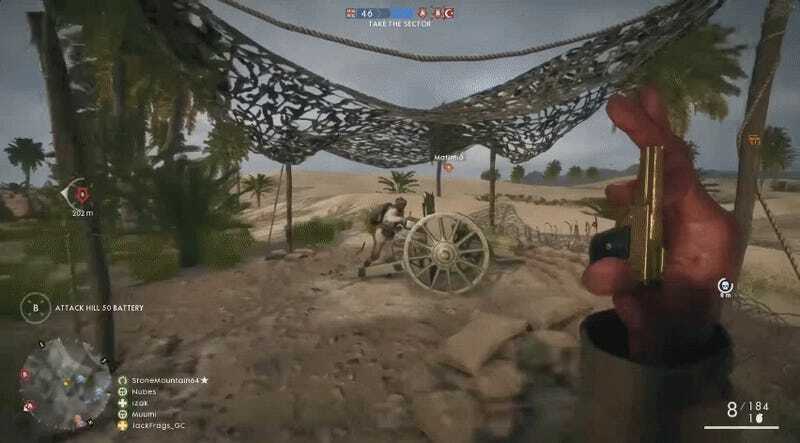 Just look at that reload animation! So elegant! A true gentleman’s weapon! Believe it or not, the Kolibri is an actual pistol designed by Austrian watchmaker Franz Pfannl in 1914 as a self defense weapon. It fired 2.7mm rounds at a velocity of 200m/s. For comparison, a Red Ryder BB gun fires at around 106m/s. I haven’t unlocked the Kolibri yet but you can check out the stats up above. Once I do unlock it? I’m going to run around the battlefield tickling foes with this wonderful little pea shooter.